A DARWIN publican has said “dickheads” on steroids are causing more trouble in Darwin’s party strip than drunk patrons. 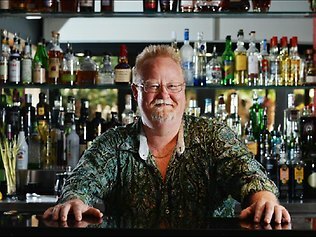 Publican Jason Hanna, who owns several bars and restaurants in Darwin and Palmerston, including the Deck Bar on Darwin’s Mitchell St, pointed at the 35 per cent increase in steroid detection and the doubling of hormone findings at Australia’s borders last financial year. “It’s not alcohol-fuelled violence, it’s drug-fuelled and it’s dickhead-fuelled violence,” he said. “Dickheads are dickheads in any language. “Even if they’re dressed well on the way in, it doesn’t take long for the attitude to shine through. Top End publican Jason Hanna. Mr Hanna said a Sunday Territorian column by David Penberthy about the same issue was widely-read and agreed with by the Top End hospitality industry. He said unprovoked attacks have increased in the nearly 20 years he’s been in the Top End. “The number of people these days on steroids you wouldn’t believe,” he said. “It’s in their mind it makes them feel bigger and stronger and fitter. “We used to have good-old-fashioned fights in the 80s. Mr Hanna said publicans have been getting a bad reputation for profiting out of “alcohol fuelled” violence. “I think everyone in the industry in Darwin is doing a good job,” he said. “No-one wants pissed people in their clubs – they get in the road and they piss people off. “But then again, someone’s always going to get punched. “You shouldn’t be able to hit anyone” He has been on an Australian Hotellier’s Alliance working group which was involved in the introduction of $560 fines for customers who refused to leave a bar. He said some fines have already been issued. “Almost every weekend we’ve a visit from Licensing and we work with them and they’re doing a great job,” Mr Hanna said.